Sales dollars increased a better than expected 14% in May to a new record high of $165,625,265 from April $145,567,700. This is 4% better than May last year at $158,900,756, which was the prior monthly record. (Sect A p.2). The 12 month moving average line of sales, which had continued to point up steadily for three years, is flattening. Lack of new construction now seems to be depressing sales somewhat. Inventories are continuing to trend down very consistently. But, in spite of reducing inventories and generally healthy sales levels, average prices look fairly flat. Sales in most price categories show consistent improvement. Inventories are also improving. Check out the chart on page A-17 to fully appreciate the inventory trends. Still, inventory remains high at over a year for anything over $500,000. In concert with ACRE, The Alabama Center for Real Estate, we have projected expectations for 2016. We use the ACRE provided data for the projections, which differs slightly from the data in this report. The projection for 2016 located here expects projected home sales in 2016 of 5,139, which is a -1.74% difference from 2015 actual of 5,230. Year to date through April actual sales are 4% above expectations. 59 more units were sold year to date than projected. On a unit basis, sales of all houses were up at 649 this month vs. last month at 588, which is up from last year’s healthy level of 612. Used Home sales increased 10% to 552 this month vs. 501 last month, which is up 5% from last year’s 527 (Sect A p.18). New Home sales were 97 this month vs 87 last month and compared with 85 last year. New listings for New homes increased to 177 from 135 in April. Used homes New listings declined to 801 from 843 in April with net inventory down. The absolute number of Used Active homes on the market, which had a slight peak mid-summer of ‘09, has been consistently improving. In May, there were 3,283 Active Used homes, a reduction from 3,929 in April and a new multi year low. New homes, which peaked in May 2006 at 2,144 Active, now sit at 503. The Absorption rate for New homes was 7 months of inventory in May vs. 8 in April. The Absorption rate for Used homes was 7 months of inventory in May vs. 9 in April. Over the last four years the drop in months of inventory for Used homes has been steady and impressive from 25 months plus in April 2008 to 7 months this May. The inventory of homes in the upper price range remains high with homes priced $500,000 and over at a year’s supply, but even here we are seeing improvement. I have been expecting construction to begin to pick-up in the under $400,000 range, and we have seen a pick-up in New homes, New listings where sales seem to be keeping up so net inventory of new home remains low in these price ranges. Average sales price for all homes has been static for the past year. For New units, price increased to $254,946 from $235,342 last month. (Sect A p.14). Average Used home prices increased to $255,245 from $249,687 in April. Average Days On Market for New Sold properties in May was 161 vs last month of 165. Days On Market for Used was 154 compared to last month 167. This entry was posted in Alabama Coast, Baldwin, Forecast, Home values, MLS, Mobile, Monthly comments and tagged Alabama Coast, Baldwin County, Days on market, MLS, Monthly comments, Residential Real Estate on June 21, 2016 by Tom Brander. I’m a bit late putting this up and in fact the next survey is underway! The ACRE report archive can be found here. This survey projects expectations for the 1st quarter of 2014. The scale ranges from 0-100 with 0 being much worse, 100 being much better, and 50 indicating no change expected. The professional real estate community has a very optimistic outlook for 2014. 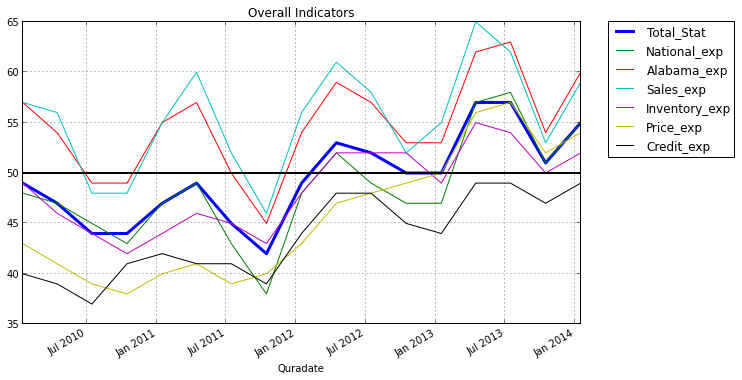 All of the overall indicators are at the highest 1st quarter levels we have seen since beginning of the survey in 2010. All of the indicators improved from last quarter and remain at or above 50 indicating expansion expected, except for credit. The availability of credit continues to be viewed somewhat negatively, at 49, two points better than last quarter. 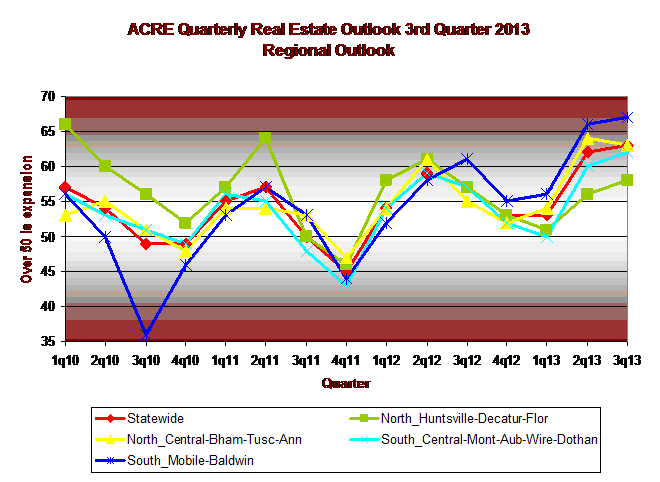 This quarter showed improvement in all regions for residential markets. 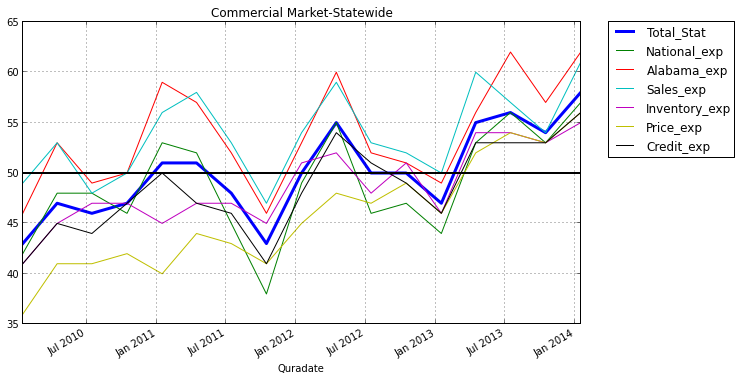 In addition, the commercial indicators are in a clear uptrend. This is encouraging, and overall measures remain in the expansion zone. The below chart reflects the aggregate scores for the survey overall. The overall total stat score is in bold blue. Commercial market participants, (the majority of the respondents are from the Birmingham market area), remained positive this quarter (Total Stat) at 58 this quarter a two point improvement from last quarter and improving 7 points to an all time high of 61 for sales expectations. Price expectations improved 3 points to 56 indicating improving pricing conditions. The score for credit availability is at a new high of 56, up 3 from last quarter. The coastal region continued to remain the most optimistic in the state at 61 (Alabama expectations), up from 58 last quarter. On an overall basis all areas sales expectations remained above 50. The coastal region, also had the highest sales expectations at 62. The moving average line is the prior 4 quarters averaged of the Alabama expectations, to remove the effects of seasonality, and it is easy to see the pretty steady upwards trend. The charts below also have a “moving average” line which averages the “Total Stat” for prior 4 quarters, by area, to smooth out the seasonal variations. The quarter to quarter variation is highly seasonal, but the moving average shows a better picture of the overall trend, which is quite positive. North Alabama total score improved 6 points from last quarter to 53, also 6 points better than last year’s 4th quarter. The sales outlook improved to 59 from 48 last quarter, but with price expecatations also climbing to 50. The North Central Region overall score climbed to 55 from 53. The sales score improved to 59 from 54. Inventory score climbed to 53 from 51, with pricing remaining at 55, and credit availability slipping one point to at 48. The South Central Region overall score improved to 53 from 49 last quarter. The outlook for sales improved to 57 from 51. The Southern Region overall score was the highest at 58. This sales score is the highest at 62. Price expectations declined by 5 to 56. Credit availability was 54 the first time we have seen it above 50. About 400 professionals responded to the 4th quarter 2013 survey which was conducted during the month of December 2013. 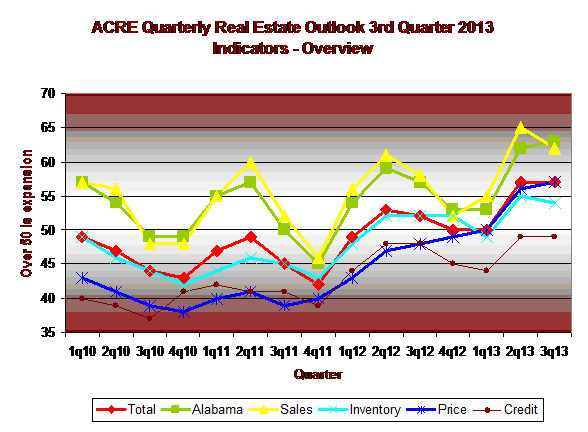 The survey, conducted by the Alabama Center For Real Estate has the largest participation of any real estate survey. It provides important market insights. Full history and raw scores can be obtained by contacting the undersigned. This entry was posted in ACRE, Alabama, Alabama Center for Real Estate, Alabama Coast, Alabama Real Estate Confidence Index, Huntsville, Jefferson County, Mobile, Montgomery, North Alabama, real estate, sales projections and tagged Absorption, Alabama Coast, Housing Statistics, Residential Real Estate on March 14, 2014 by Tom Brander. This survey projects expectations for the 4th quarter of 2013. The scale ranges from 0-100 with 0 being much worse, 100 being much better, and 50 indicating no change expected. The professional real estate community remained optimistic this quarter. All of the overall indicators are at the highest 4th quarter levels we have seen since beginning of the survey in 2010 except for the inventory indicator, which is 2 points lower than last year’s 4th Q. All of the indicators, while off from last quarter, remain at or above 50 indicating expansion expected, except for credit. The availability of credit continues to be viewed somewhat negatively, at 47, two points off last quarter. The national score at 51, while down 7 points from last quarter, still indicates respondents are expecting modest improvement in the overall economic picture. The participants are more positive on the statewide conditions at 54, off 9 points from last quarter. Inventory expectations moderated to 50, down 3 points, indicating a balanced market. Sellers are seeing improved pricing with a score of 52, down 5 points from last quarter. Financing continues to be viewed negatively at 47, indicating that buyers may face tight financing conditions. The coastal region continued to remain the most optimistic in the state at 58 (Alabama Stat). On an overall basis all areas sales expectations remained above 50. 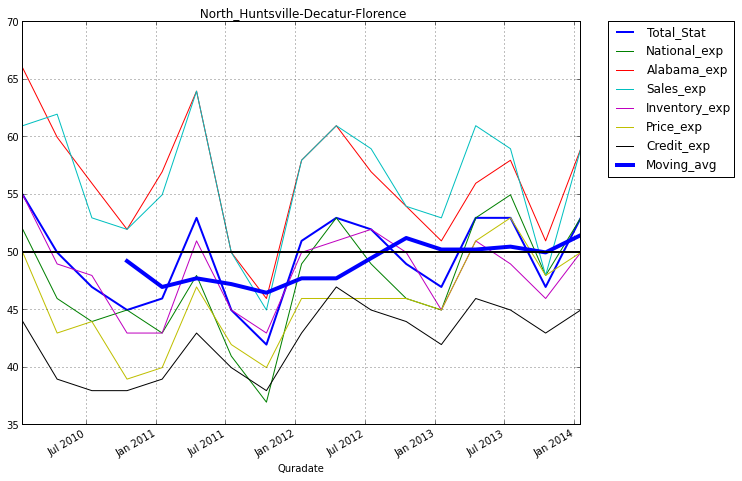 Huntsville, North Alabama was the lowest at 51. This quarter showed stability in all regions. Historically, we usually see a marked decline in 4th Q expectations. This is encouraging, and overall measures remain in the expansion zone. Commercial market participants, (the majority of the respondents are from the Birmingham market area), remained positive this quarter (Total Stat) at 54 this quarter a two point decline and declining 3 points to 54 for sales expectations. Price expectations dropped 1 point to 53 indicating improving pricing conditions. The score for credit availability is looking stable at 53. All areas including North Alabama declined 6 points to 47, 2 points lower than last year’s 4th quarter. The total score is 47. The sales outlook slipped to 48, but with pricing also slipping to 48. The North Central Region overall score remained positive at 53. The sales score declined to 54, off by 7 points. Inventory score declined to 51, down 4 points, with pricing declining to 55 from 58, and credit at 49. The South Central Region overall score declined to 49 from 56 last quarter. The outlook for sales declined to 51 from 61. The Southern Region overall score was the highest at 54. This sales score is the highest of the regions at 58, off 9 from last quarter. Price expectations declined by 5 to 56. This entry was posted in Absorption, ACRE, Alabama Center for Real Estate, Alabama Coast, Alabama Real Estate Confidence Index, Forecast, Huntsville, Jefferson County, Mobile, Montgomery, North Alabama, real estate, sales forecast, Shelby County and tagged 4th quarter, Alabama, Alabama Real Estate Confidence Index, Birmingham, Business and Economy, North Alabama, price expectations, real estate, September 2013 on October 14, 2013 by Tom Brander. The survey projects expectations for the 3rd quarter of 2013. The scale ranges from 0-100 with 0 being much worse, 100 being much better, and 50 indicating no change expected. The professional real estate community remained optimistic this quarter. 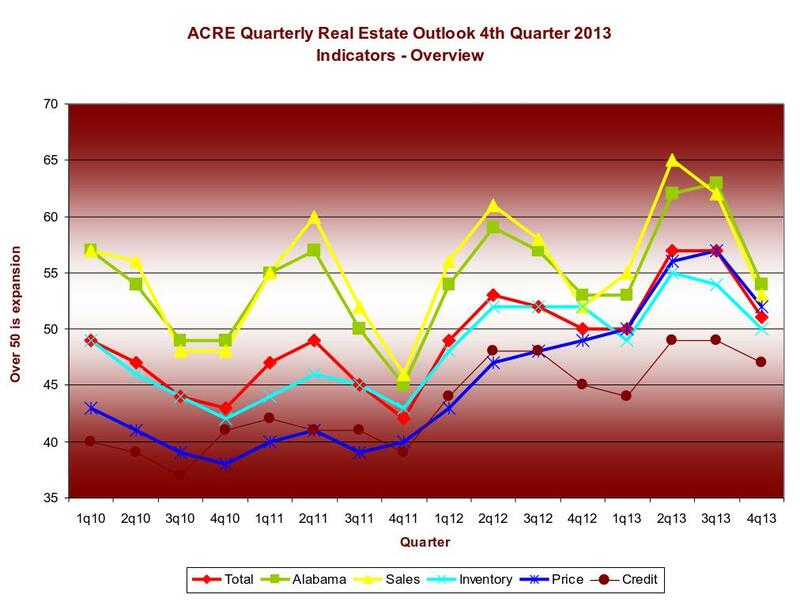 All of the overall indicators are at the highest 3rd quarter levels we have seen since beginning the survey in 2010. Sales expectations are at 62, down 3 points from last quarter, yet still the highest 3rd quarter measure, and up 4 points from last year. The availability of credit continues to be viewed somewhat negatively, at 49, the same as last quarter. The national score at 58, up 1 point from last quarter, indicates that respondents are continuing to see improvement in the overall economic picture. The participants are more positive on the statewide conditions at 63, up 1 point from last quarter. Inventory expectations moderated to 54, down 1 point, indicating continued reduction of supply expected. Sellers are seeing improvement for improved pricing with a score of 57, up 1 point from last quarter. Financing continues to be viewed negatively at 49, indicating that buyers may face tight financing conditions. The coastal region continued to remain the most optimistic in the state at 67 (Alabama Stat). On an overall basis all areas sales expectations remained above 60 except the Huntsville North Alabama area at 59 however expansion is still expected. This quarter showed stability in all regions. Historically, we usually see a marked decline in 3rd Q expectations. This is encouraging, and overall measures remain in the expansion zone. Commercial market participants, (the majority of the respondents are from the Birmingham market area), remained positive this quarter (Total Stat) at 54 this quarter a one point decline and declining 3 points to 57 for sales expectations. Price expectations improved 2 points to 54 indicating improving pricing conditions. The score for credit availability is looking stable at 53. 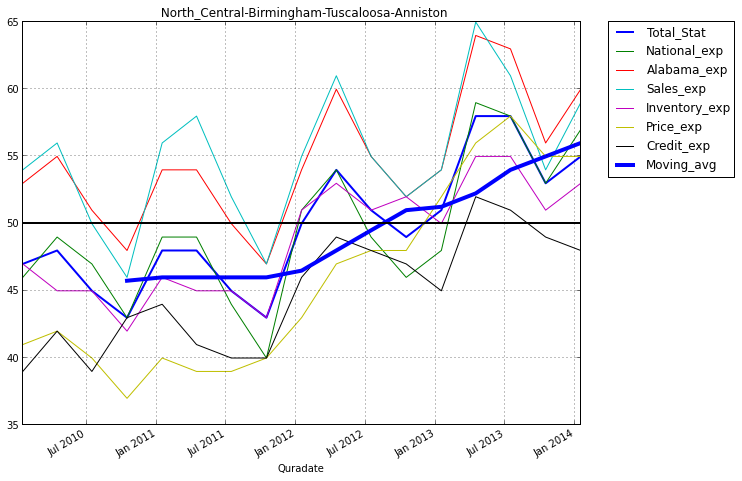 All areas including North Alabama had stable total scores which is very favorable since historically the 3rd quarter normally shows a decline. The total score remains 53. The sales outlook is positive at 59 off by 2 but with pricing pressure positive at 53 (up by 2). The North Central Region overall score remained at 58. The sales score declined to 61, off by 4 points. Inventory score remained at 55, with pricing improving to 58 from 56, and credit at 51. 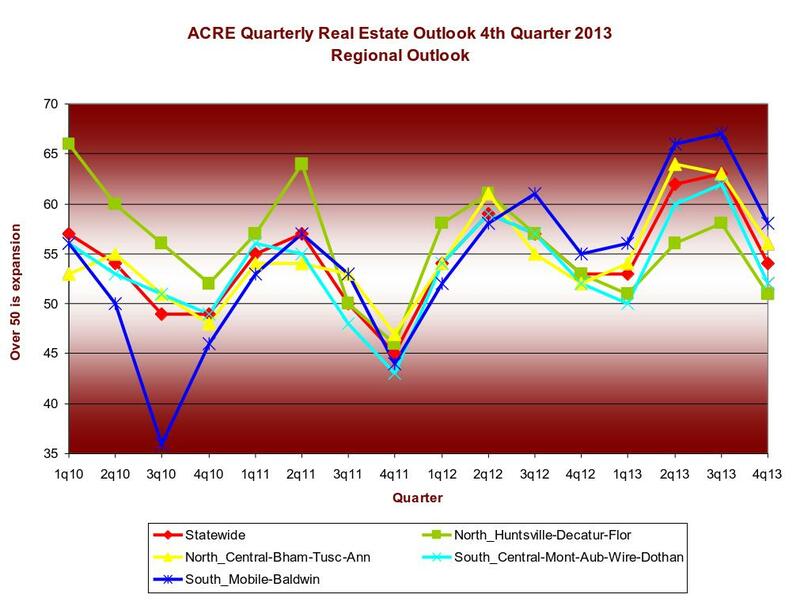 The South Central Region outlook for sales declined to 61 from 65. We saw a dramatic uptick in the Montgomery, Central Alabama Rural segment with sales expectations at 57, up from 42; our sample size here was quite small however. The Suburban areas show sales expectations of 63, off from 69. The Southern Region sales score is the highest regions at 67, off 2. Price expectations declined slightly to 61 points from 62 last quarter. This entry was posted in ACRE, Alabama, Alabama Center for Real Estate, Alabama Coast, Alabama Real Estate Confidence Index, Baldwin, Forecast, Huntsville, Jefferson County, Mobile, Montgomery, North Alabama, sales forecast, sales projections and tagged 3rd quarter 2013, Alabama, Birmingham, Montgomery, North Central Region, real estate, South Central Region on July 22, 2013 by Tom Brander. Sales dollars decreased 22% in November to $72,269,421 from October’s $81,845,796. This is 23% above November last year at $58,976,063. (Sect A p.2). This is a solid performance in a normally seasonally slow month. 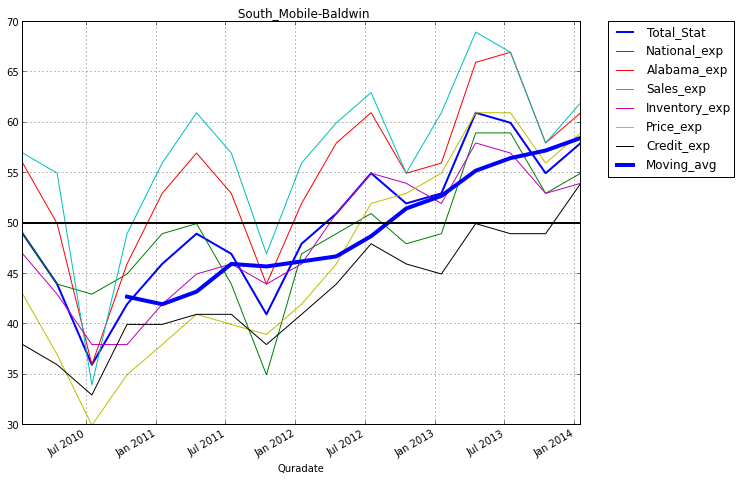 The 12 month moving average line of sales is continuing to point up. Inventories are continuing to come down. On a unit basis, sales of all houses were down 9% to 324 this month vs. last month at 358, which is unchanged from last year’s 325. The year to year comparison remains reasonable. At the high end, the $900,000 and over sales were 7 this compared with 11 for the prior two month, compared with 4 last year. Used Home sales declined 10% to 294 this month vs. 325 last month, which is down 4% from last year’s 306 (Sect A p.18). New Home sales were 30 this month vs 33 last month which compares favorably with 19 last year. Increasing sales of New Homes is indicative of a recovering market. New listings for New homes remained about the same at 59 and 57 in October. Used homes New listings decreased to 496 from 667 in October with net inventory down. The absolute number of Used Active homes on the market, which had a slight peak mid-summer of ‘09, has once again been improving. In November, there were 3,283 Active Used homes, a reduction from 3,641 in October. The New home market, which peaked in November 2006 at 2,144 Active, now sits at 311. The Absorption rate for New homes was 9 months of inventory for November vs. 9 in October. The Absorption rate for Used homes was 10 months of inventory for November vs. 11 in October. Over the last four years the drop in months of inventory for Used homes has been steady and impressive from 25 months plus in November 2008 to 9 months this November. Average sales price for all homes has been stable for the past year. For New units, prices decreased to $234,678 from $247,980 last month. (Sect A p.14). Average Used home prices decreased to $221,868 from $226,654 in October. Average Days On Market for New Sold properties in November was 136 this month vs. 216 last month. Days On Market for Used was 161 this month vs. 179 last month. We see improvement in the second home market, which is needed for the coastal area to gain strength. 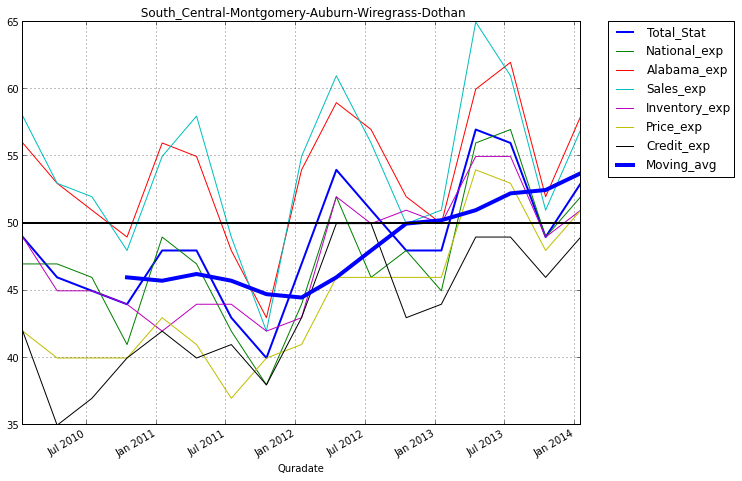 While there is still a lot of inventory, I think the situation on the coast has turned quite positive. This entry was posted in Alabama Coast, Baldwin, Inventory, Mobile, Monthly comments and tagged Alabama, Alabama Coast, Baldwin County, Monthly comments, November, Real estate pricing, Residential Real Estate on December 17, 2012 by Tom Brander. This material was presented at the meetings at the Baldwin County Realtors and Mobile county Realtors on October 23 and 25th. This entry was posted in Alabama Center for Real Estate, Alabama Coast, Alabama Real Estate Confidence Index, Baldwin, Mobile, sales forecast, sales projections and tagged Alabama, Baldwin, Market projections, Mobile County Alabama on October 26, 2012 by Tom Brander.